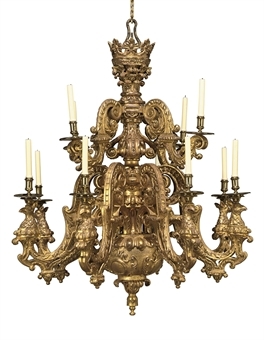 This chandelier by Claud Demeny dates from 1735 and it believed to have originated from St. John’s Cathedral in ‘s-Hertogenbosch, Netherlands although it later years it hung in the offices of insurance company Royal and Sun Alliance. Its only been in the Almshouses since November 2007, replacing the giltwood ‘Chandos’ chandelier by James Moore from around 1719 which was sold for £337,250 at Christies to help fund almshouse repairs. That chandelier was mades for James Brydges, 1st Duke of Chandos for the Chapel at Cannons. Later aquired by Cholmley Turner for the Chapel of his great uncle Sir William in 1747. This entry was posted in Kirkleatham by chris.twigg. Bookmark the permalink.